Louis from Louisiana is a freelance assistant film editor who divides his time between Nashville and Alexandria, Virginia. His warm brown eyes only begin to tell you his story. It starts in New Orleans after the storm, THE STORM, you understand. 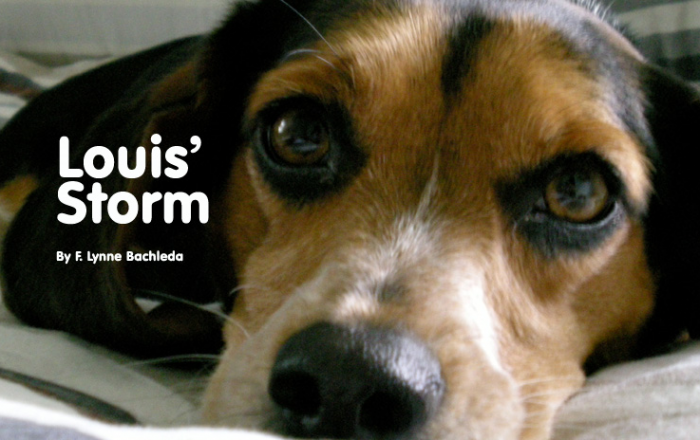 Louis (pronounced “Lew-ee,” s’il vous plais) is a Blue Tick Beagle, and is as sweet, bed-loving, and fun as a dog can be. About ten days after Katrina, my television reporter friend Annette and her two crew members pursued a story at the downtown New Orleans Greyhound Bus station. Because the jails were flooded, the city set up temporary cells there made of chicken wire cages large enough to hold two or three humans. National Guardsmen provided security for this surreal environment. While Annette and crew were waiting at the back door for an arrival of new prisoners charged with looting, they noticed a dirty little dog who was curled in a fearful ball and bleeding from his nose. Distraught, Annette turned away from the dog. If his back was broken, what hope was there? She began to walk away, heartsick at seeing no good possibilities for him. The sound man said to her, “Why don’t you take him, Annette?” “Yeah, you take him,” chimed in the camera man. She turned toward the dog as Louis uncurled himself and slowly came to her. He was injured, but not as severely as everyone thought. That was all it took. Getting him home was less of a problem than you might imagine. New Orleans was so overrun with animals needing evacuation that the airlines were letting people take them on their flights at no charge. Louis, as he was named, now enjoys the gold-standard of pet care in a two-lesbian household. He still has a few small, lingering health problems; we’ll never know what he ingested while trying to survive. Of course for all his troubles, Louis, whose happy-ending story was not unique, was absolutely one of the lucky ones. He wasn’t, for example, trapped alone in a house, drowning or starving, and then rotting for weeks. The lessons of Louis’ storm are several. Prayers are answered. Responding to those who need us brings to the surface the best of our shining humanity. Life turns on a dime. And just look into Louis eyes and remember, in a storm walk toward the ones who want to help you. http://www.proverbs1210rescue.org/ A non-profit animal rescue organization that operates every Saturday from the Bellevue Petco store.